Kent Annan is a senior fellow at Wheaton College’s Humanitarian Disaster Institute and is author of the forthcoming book, You Welcomed Me: Loving Refugees and Immigrants Because God First Loved Us (InterVarsity Press, 2019). Calling people “animals” misses the mark on all of this, even if the comment only referred to gang members. No, we shouldn’t shrug at evil or avoid calling out awful things and people who are causing great suffering — an important part of our power with language. But even in naming evil we’re to be guided by love for the suffering and those who cause suffering. Jesus loved the criminal on the cross next to him on Golgotha. Each person is made in God’s image and loved by God. Rubble after the earthquake in 2010. Image courtesy Haiti Partners. On this 5th anniversary of the earthquake, I remember four-story buildings collapsed into a stack of concrete pancakes. I remember circling over Port-au-Prince in a small plane with other relief personnel six days after the earthquake, finally able to get there. I remember bodies being pulled from rubble. I remember how it seemed to take so long for rebuilding to start. People responded generously around the world, though the overall impact has been hard to track. It has been encouraging to see building and infrastructure progress the past couple of years. Still, the big picture can make my faith and hope go a bit wobbly. It’s when I think of people — and when I start reflecting on the earthquake, people come first to mind — that the sadness comes on stronger, but so does the reason for faith and hope. My daughter attended her first day of kindergarten today. A poignant milestone dressed up in an exceptionally cute plaid jumper. My wife and I thought we were pretty cool with it. Our daughter had attended preschool, after all, so this wasn't a major logistical change. She was excited as we dropped her off, said goodbye with a smile over her shoulder, then back to drawing in her new notebook. We still thought we were cool with it after we signed up for PTA at the courtyard table. We ran into the local rabbi. My wife is pastor at a Lutheran church in town and they cross paths regularly. The rabbi's third child was starting kindergarten. He's an old hand at this. I just watched a 60 Minutes expose on Greg Mortenson, co-author of Three Cups of Tea and co-founder of the nonprofit the Central Asia Institute. Watching this news story that accused Mortenson of fabricating key stories in his book, lacking organizational/financial transparency and effectiveness, and receiving "excessive" personal benefits from his organization felt like a punch in the gut, even if it's of the too familiar heroes-come-crashing-down variety. It must have felt like a punch to many. None of us like to give our hard-earned pennies or dollars or peace prize money to someone who betrays our confidence. I felt it in my gut, too, because Mortenson and I have a lot in common. We've both published two memoirs about our experiences and work for education in the developing world -- he in Afghanistan, and me in Haiti. We both travel to speak about our work -- albeit he on a much grander, best-selling-er scale than me. Once I stood for half an hour in a book line to talk with him for two minutes and he seemed touchingly humble and friendly. Watching the unfolding tragedy in Japan of course has me reflecting on the past fourteen months in Haiti since the earthquake there. The jolt in Port-au-Prince herniated a disk in my lower back last month. The pain is making it hard to sleep at night. Driving today through Port-au-Prince in the glaring summer sun, there is still plenty of rubble being removed. Presumably, almost seven months after the earthquake, bodies are still being discovered. 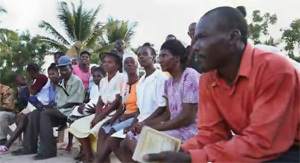 After Hurricane Jeanne struck Haiti in 2004, people gave abundantly from what little they had.